With the camera centric Oppo R9 and Oppo R9 Plus scheduled to be unveiled later next week, the detailed specs of the handsets has once again been leaked ahead of the announcement. 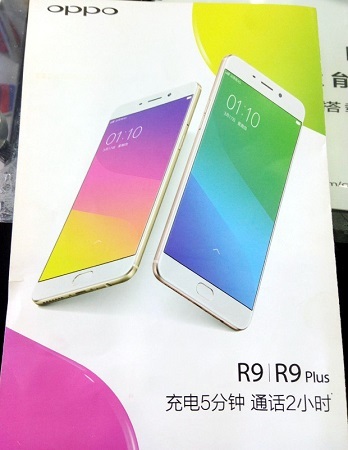 The promotional material of the Oppo R9 and Oppo R9 Plus have surfaced, giving a complete insight into the internals of the devices. For starters, both the handsets are said to employ full HD AMOLED display panels with screen sizes of 5.5 inches and 6 inches respectively. Both the devices are expected to be powered by an octa core processor (Snapdragon 652 for the Oppo R9 Plus) with a massive 4 GB of RAM. Both the Oppo R9 and Oppo R9 Plus are expected to sport a massive 16 MP rear facing camera with LED flash. The Oppo R9 would have a 13 MP front facing camera but the Oppo R9 Plus would have the same 16 MP front facing camera. Both the handsets are said to flaunt a fingerprint scanner embedded in the Home button.